We have enjoyed the last four days on the beautiful Hawaiian island of Maui. This is often called the Valley Isle and its very easy to see why, as you drive around. 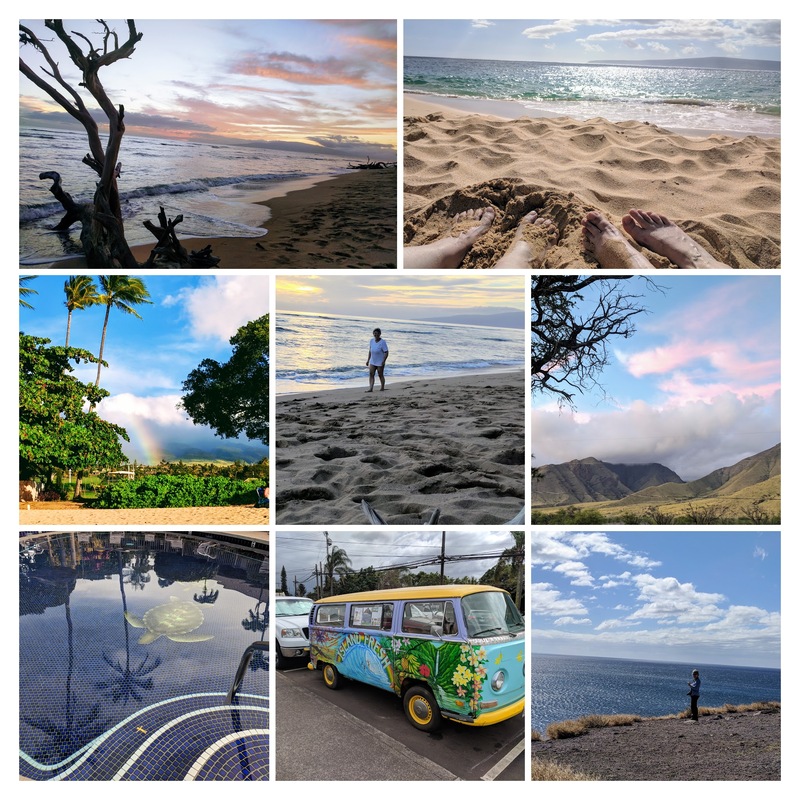 Maui is a relatively small island, only 48 miles by 26 miles, yet still offers many contrasts in landscapes and eco-systems. It also grows an abundance of crops including Pineapple, Bananas, Papaya, Guava, Coffee, Macadamia (& other) nuts, Cacao and about as many kinds of trees, herbs, perennials that you can imagine. Inland, the landscape is mainly mountains, forests and deep riven valleys, as well as the Crater from its Volcanic past. There are plenty of rich agricultural fields and some grazing for cattle and horses. As you come to the coast, you get to see what Maui is famed for, some of the Worlds best beaches. Powder white sand, clear blue skies and stunning views in every direction. Although it is technically possible to drive around the entire island, there are parts that are so hazardous that car hire insurance is invalidated if you do go on the more precarious routes. We decided to stay safe and stick to the main highways. As well as the beaches, visitors come for the Golf and it seems you can hardly go a mile or two without seeing a course. The second reason, certainly during the winter is to see the majestic Humpback Whale that migrates from Alaska during the Winter Months to the sheltered shallow seas whilst they mate and bring up their young. More on our Whale watching tomorrow. We also visited a plantation, took in the beautiful scenery, but mostly we just chilled on the beach. Even little man enjoyed himself. Following a vegan diet whilst travelling has its challenges, but the Hawaiian islands have been fairly kind. The Japanese influence means that Vegetarian Sushi, Tofu and Rice dishes are in plentiful supply. We also found a fantastic wholefood store called Mana Foods in a little town called Paia which supplied us with the best Vegan and gluten free alternatives ever. They beat the national US chain Wholefoods, hands down. We particularly enjoyed the Gingerbread Cupcake. If only I could get the recipe!